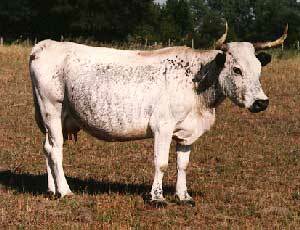 Florida Cracker Cattle are Florida's equivalent to the better known Texas Longhorn. Florida Cracker Cattle, Texas Longhorn Cattle and the various breeds of Central and South America cattle known collectively as Criollo cattle all descend from the original cattle imported into the Americas by the Spanish. The name Florida Cracker has only been used in recent years. Previously the cattle have been referred to as Piney Woods, Florida Scrub or Florida Native Cattle. While Florida Cracker cattle are, in general, similar in appearance to Texas Longhorn cattle, they are smaller in size and do not have the same extreme horn length as the Texas Longhorn. The nutrition available to what were essentially feral cattle for hundreds of years and thick "scrub"--heavily wooded lowland areas--in which they lived would not have been conducive to the survival of larger, longer-horned animals. While the horn length of Florida Cracker cattle is not extreme, their shapes can include very interesting twists in aged cows and steers. Colors and spotting patterns are very similar to those observed in Texas Longhorns. The mature weight of Florida Cracker cows is usually under 900 pounds with those of so-called dwarf or "guinea" animals being much smaller. The age at puberty of well-fed Cracker heifers is very young, even prior to weaning and their fertility is excellent. These traits along with their ability to withstand the heat, insects and humidity of Florida's long summers made them very well-adapted for low-input beef production. In spite of the importation of purebred breeds of northern European origin beginning as early as the 1850s, large numbers of Florida Cracker cattle were found until the mid-1950's but were then nearly wiped out through crossbreeding with Brahman, Hereford and Angus. Several herds of Cracker Cattle in Florida as well as similar types in Mississippi, Alabama and Georgia were preserved by families that appreciated their hardiness, heat tolerance and heritage. The State of Florida has been involved in preservation programs for Florida Cracker Cattle since 1970 and currently has herds maintained at four locations. In 1989 the Florida Cracker Cattle Breeders Association was formed to promote the preservation of Florida Cracker Cattle and over 400 animals were evaluated and registered to serve as foundation animals.